The next morning after breakfast, we toured the Fairbanks visitor center. It had a grass layered roof with plants grow outside on top of it! 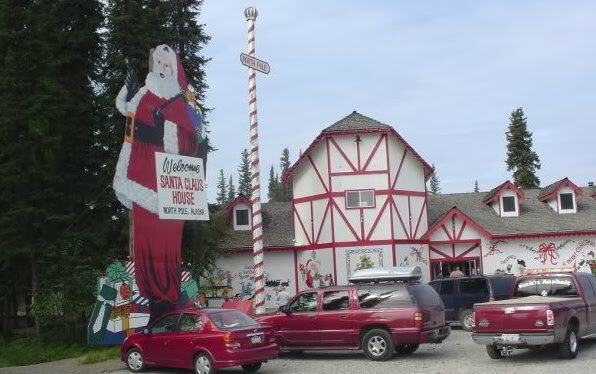 Then we headed south back to the town of North Pole. We saw Santa inside and one of the world’s largest Christmas stores. Of course we have to buy some ornaments and mail some postcards home. Amazingly, the post office in town is where letters to Santa go to in the U.S. Volunteers take them and write back to the kids. That afternoon we did a tourist goldmine tour. First we toured the dredging operations to see where all of the gold dirt was separated from the river basin. We then had barbecue lunch in a mess hall which was yummy. 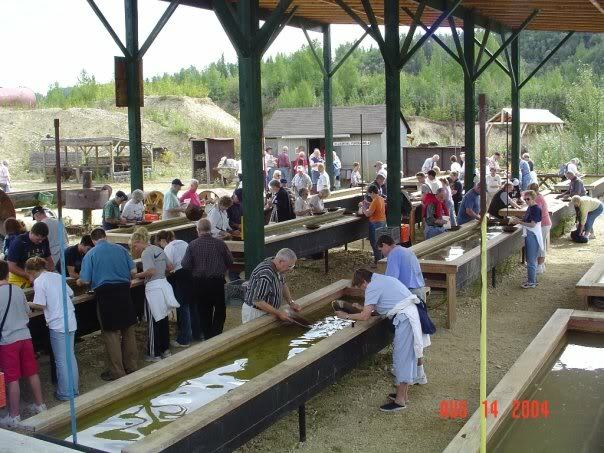 Then we went gold panning in a shed area. We struck gold and gave all of our gold to Mom. Afterwards, we went to the Assayer’s Office where the gold was weighed and then made into a jewelry necklace charm for mom. 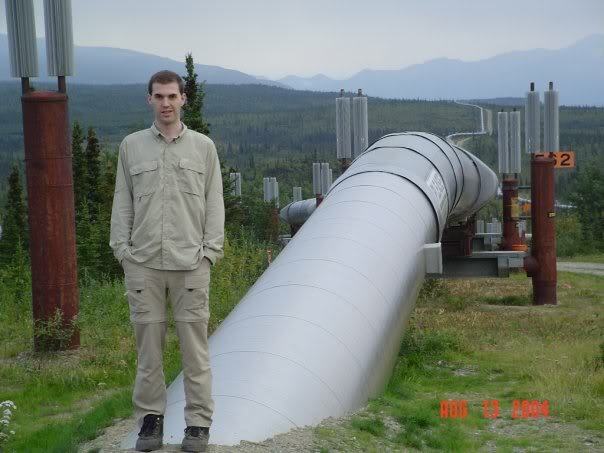 After finishing the tour, we stopped at a visitor center for the Trans-Alaska Pipeline. We learned about the solar powered radiators that kept the oil warm, the pumping stations and the “pigs” that were inserts to continually clean the pipeline. When we finished visiting the pipeline, we headed northeast to the Chena Hot Springs Resort. We stopped along the way to see some moose grazing in nearby streams. I felt like I was in the television show Northern Exposure. The Hot Springs Resort is one of the most famous resorts in interior Alaska. 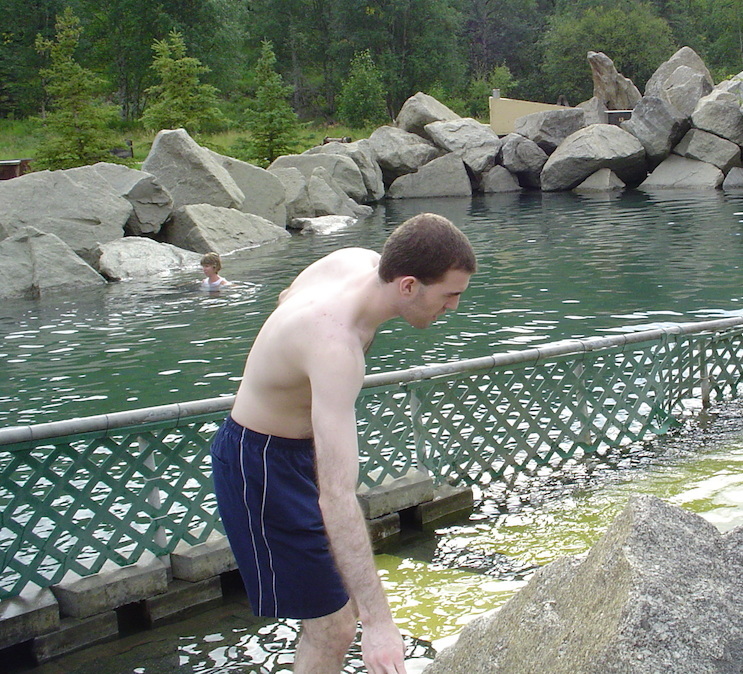 It’s interesting that the water chemistry is very different from other American hot springs. We enjoyed relaxing out in the springs and found numerous differences in the water temperatures. We returned that evening to Fairbanks and had dinner in town before hitting the sack early.